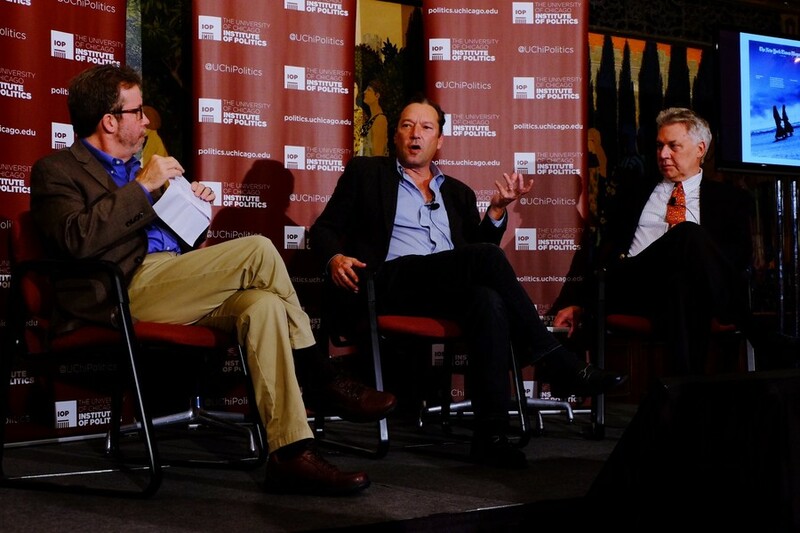 Journalist Scott Anderson (center) discusses his New York Times piece “Fractured Lands”on the Arab world at Ida Noyes Theater on Nov. 2 with Pulitzer executive director, Jon Sawyer (right), and former Tribune editor Kerry Luft. The IOP-hosted event, How the Arab World Came Apart: The Groundbreaking New York Times’ Multimedia Project “Fractured Lands,” was moderated by Pulitzer Center Executive Director Jon Sawyer and former Chicago Tribune Foreign Editor Kerry Luft. Anderson discussed his months visiting Middle Eastern and Arab countries including Syria, Iraq, Tunisia, and Libya, and how he incorporated the stories of six individuals he met there into the article. “Fractured Lands” encompasses the Iraq War, the tumultuous Arab Spring, and the creation of ISIS. The editor-in-chief of The New York Times Magazine, Jake Silverstein, gave Anderson the unique chance to spend 18 months developing a comprehensive look at the modern Middle East since the Arab Spring in 2010. The article was the first in the history of The New York Times Magazine to fill an entire issue. Of these six individuals, according to Luft, two are refugees today, one is likely fighting ISIS, another awaits execution, the children of one are in jail as political dissidents, and another is described as hoping for the unlikely return of a monarchy. Anderson briefly provided the backstories behind Pellegrin’s projected photographs, which depicted these six people as well as many others, including fleeing civilians in southern Iraq, Libyans crossing over into Tunisia, a secret prison camp in Kurdistan, a pro-human rights activist in Egypt, and a massacre by ISIS in northern Iraq. Having covered some fifteen wars, Anderson noted the changing face of foreign correspondence in the Middle East.